What Are the Uses & Benefits of Vitamin B Complex? Who Can Benefit from Vitamin B Complex? Are There Any Side Effects of B Complex? How Do I Take Vitamin B Complex? Can I Stack Vitamin B Complex With Other Supplements? In order to help you find a good product we’ve researched & narrowed down the best vitamin B-complex supplements on the market right now. 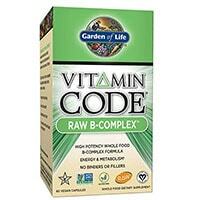 Garden of Life Vitamin Code Vitamin B Complex is a raw whole food B complex supplement that is gluten free, dairy free, non-GMO, vegan, and does not use binders or fillers. It includes a raw vegetable and fruit blend as well as probiotics to improve the digestive benefits of vitamin B complex. 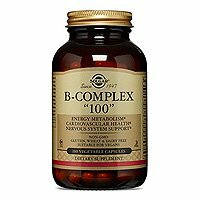 This B complex pill helps to improve energy, support heart health, and support the digestive system as well as mental health and the immune system. Includes vegetables, fruits, and probiotics. Who makes it: Garden of Life is a natural supplement brand that produces organic, non-GMO, raw whole food supplements. Their products are clean, nutritious, and high quality. Every ingredient they use is traceable to the source. 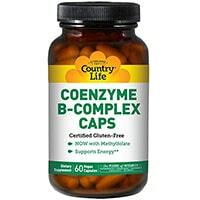 Country Life Coenzyme B Complex is a B complex pill that is formulated with additional coenzymes inositol, phosphatidylcholine, PABA, and alpha-lipoic acid. Inositol is a vitamin like substance that may help to combat anxiety and support mental health. Phosphatidylcholine is a naturally occurring fat in cell membranes and blood proteins, and helps to support liver and intestinal health. PABA is an amino acid that is part of folic acid, also known as vitamin B9, that supports skin and hair health as well as intestinal health. Finally, alpha-lipoic acid is an antioxidant. All together, these ingredients act as coenzymes and strengthen the health benefits of vitamin B complex, making Country Life Coenzyme B Complex great choice for B Complex supplementation. Who makes it: Country Life Vitamins is a dietary supplement producer that was founded in Long Island, New York in 1971. They were the first supplement company to be certified entirely gluten free, and their manufacturing facility is certified USDA Organic. They offer the highest quality, purity, and potency in their vitamins packaged in glass containers to promote maximum freshness. Who makes it: Pure Encapsulations is a hypoallergenic, research based supplement company that is committed to supporting your health. They manufacture their products in GMP certified facilities with high quality standards. Solgar Vitamin B-Complex is a vegetarian vitamin B complex pill that is fortified with inositol and choline. Choline is an important macronutrient to liver function, brain development, muscle movement, nerve function, and maintaining a healthy metabolism. These ingredients all work together as a beneficial vitamin B complex stack for supporting your overall health. Who makes it: Solgar is a well-known nutritional supplement company that has been around since 1947, making it one of the oldest supplement brands. They provide consumers with high quality, innovative, science-based nutritional supplements to help optimize health. 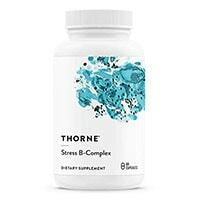 Thorne Research Stress B-Complex is a vitamin B complex pill that is made with naturally sourced ingredients. It is pure vitamin B complex, and does not include any additional supplement ingredients. Thorne Research formulates this product using some methylated B vitamins, and they utilize vitamin B9 in the form of folate instead of folic acid. This is intended to enhance bioavailability and, and to enhance the benefits of this effective vitamin B complex supplement. Who makes it: Thorne Research is a dietary supplement producer that launched its first product, Pure Ascorbic Acid, in 1984. For over 30 years, they have been dedicated to improving the health and lives of their customers through health supplements. 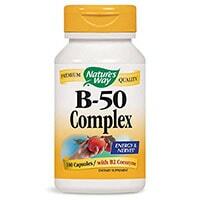 Nature’s Way B-50 Complex is a very inexpensive vitamin B complex pill that is fortified with choline and inositol. It is gluten free and does not contain any salt, sugar, yeast, wheat, soy, or dairy products. It also does not use any artificial flavors, colors, or preservatives. The addition of choline and inositol provides positive synergistic benefits that improve the performance of the B vitamins in this supplement. Who makes it: Nature’s Way is a brand that was inspired by Native American medicine. The founder looked towards the healing power of plants to help support his ailing wife’s health, which led him to the power of natural supplements. In 1969, Tom Murdock founded Nature’s Way. The use GMP certified facilities, are a part of the non-GMO project, and they are TRU-ID certified. 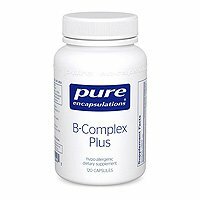 Nature’s Bounty Super B-Complex is an affordable vitamin B complex that comes in tablet form and includes all of the B vitamins, as well as vitamin C. Vitamin C is a powerful antioxidant and immune system support, and it helps to maintain connective tissues, bones, blood vessels, and skin. Together with vitamin B complex, this is a great supplement for supporting energy production, boosting the immune system, and easing the aging process. Who makes it: Nature’s Bounty is the flagship brand of Nature’s Bounty Co., which is a family of wellness brands that produces products committed to optimizing your health. They provide high quality supplements at an affordable price that meet their Quality Assurance Standards, and are manufactured in GMP certified facilities. 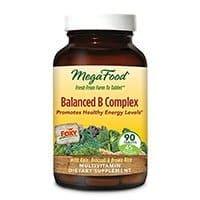 MegaFood Balanced B Complex is a good B complex product in tablet form that includes organic kale in its formula, and provides naturally sourced B vitamins from Lundberg Family Farms and Foxy Organic Fresh Produce. Its B vitamins are naturally sourced from cerevisiae, also known as brewer’s yeast, brown rice, and broccoli. It helps to support metabolic health, digestive health, cardiovascular health, and more. Who makes it: MegaFood is a New Hampshire based natural whole food supplement producer that was founded in 1973. They control their production from farm to supplement, which means their ingredients are traceable and their products are transparent. 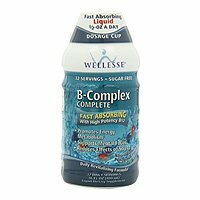 Wellesse B-Complex Complete Liquid is a liquid B complex supplement that is fortified with vitamin D, inositol, choline, and blueberry extract. Vitamin D is an essential vitamin that helps the body absorb calcium, supports bone strength, cardiovascular health, and much more. Blueberry extract provides additional antioxidant benefits which help to protect cells from oxidative free radical damage. Who makes it: Wellesse is a liquid vitamin producer that is now a part of the supplement company, Nature’s Way. Wellesse was founded 25 years ago in the Pacific Northwest. Their products are certified gluten free and available in 25,000 retail locations. 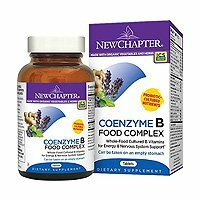 New Chapter Coenzyme B Food Complex is an organic, non-GMO, gluten free, vegetarian vitamin B complex supplement. It comes in the form of a tablet and is fortified with additional herbs and extracts intended to support and enhance the benefits of vitamin B complex. This is an effective vitamin B complex supplement that uses naturally sourced B vitamins to benefit your health. Spinach powder, lecithin, blueberry powder, turmeric, ginger, chamomile, ginseng, etc. Who makes it: New Chapter is a natural supplement company that was founded by Paul and Barbi Schulick in 1982. The brand is committed to sustainable and environmentally friendly sourcing, and they practice regenerative agriculture, use 100% recyclable shipping boxes, and are committed to reducing their carbon footprint. Your metabolism is the process that provides your body with energy. It is defined as “chemical reactions that maintain the living state of cells.” The definition itself reveals how important your metabolism is to your health. Neglecting it can cause weight gain, muscle weakness, fatigue, hormone imbalances, thyroid dysfunction, digestive issues, and more. Vitamin B complex food sources include milk, liver, yeast, whole grain cereals, nuts, eggs, yogurts, meats, fruits, and leafy vegetables. However, these foods may not contain very substantial amounts if they are cooked or combined with alcohol, which destroys the vitamins. These vitamins are all water-soluble, contribute to metabolic health, and are essential to overall health. Each one has additional benefits that are unique to the vitamin on top of the overarching metabolic benefits, which results in synergistic health benefits. Vitamin B complex supplements are available in many forms such as pills, capsules, softgels, sublinguals, drops, and more. Deficiency: B vitamin deficiency is not very common in the developed world, but it’s still quite possible, particularly for those who do not eat a balanced, healthy diet. Symptoms of B vitamin deficiency can vary from fatigue and confusion to a compromised immune system. Taking a B vitamin complex is often recommended for those at-risk of being deficient in these nutrients. Wound Healing: B vitamins, particularly B1 and B5, have been shown to play an important role in wound healing. Many health practitioners recommend that their patients take a B complex vitamin after undergoing surgery or being wounded. It’s worth noting that most of the studies looking at the wound healing effects of B vitamins have been conducted on animals, so more human research is needed. Energy: B vitamins are often touted for their effect on energy levels. Manufacturers claim that B vitamins can help to boost energy levels and the metabolism. These claims are overblown, however. B vitamins do play a role in helping your body turn food into energy, however, taking more B vitamins will not necessarily increase energy. With that said, if your body is deficient in one or more B vitamins, then taking a B complex might actually help to improve energy production. Immunity: Some B vitamins, particularly B6, are important for immune system health. If you are deficient in some key nutrients including vitamin B6, you may be more prone to having a weak immune system. 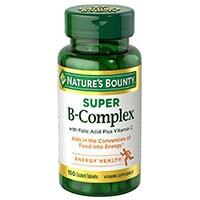 So, for those deficient in B vitamins, taking a B complex may help enhance immunity. With that said, the evidence to support this effect is slim. It’s also unclear whether taking B complex vitamins will have any effect on already healthy individuals. Pregnancy: Vitamin B9, otherwise known as folate or folic acid, is very important during pregnancy. Getting adequate B9 in your diet during the early stages of pregnancy can help to reduce the risk of birth defects. Other B vitamins, including B7, may also be beneficial for soon-to-be mothers. Mental Health & Cognition: Folic acid (B9) can affect the mood and cognitive function, and may be beneficial for those suffering from depression. Later in life, it can also help protect against cognitive decline in old age. Other Uses: The B vitamins play a huge number of roles in our bodies. If we don’t get enough, our health can suffer. B vitamins have an effect on testosterone production, skin health, acne, migraines, carbohydrate breakdown, blood glucose levels, and more. Effects on these health markers have been observed, but definitive clinical research has not been established. Overall, the trend is clear: there are a lot of potential B vitamin benefits, but most only come into play if the person taking the supplement is actually deficient in the related nutrient. Thus, those who eat healthy, balanced diets may experience little to no benefit from taking a B complex, while those at risk for B vitamin deficiency (those who eat an unhealthy diet, older individuals, pregnant women, etc.) may notice significant benefits. Athletes – Athletes can especially benefit from vitamin B complex, because B complex vitamins support the metabolism and help to provide your body with sustained energy. This can help to improve athletic endurance. B vitamins also play an important role in the production and repair of cells, which is the basis of the athletic recovery process. Overall, vitamin B complex supplements can support sustained energy and endurance, improve athletic recovery, and help to improve overall athletic performance. Older Adults – Folate, niacin, riboflavin, vitamin B6, and vitamin B12 are common vitamin deficiencies for adults over 50 years old. Vitamin B complex supplements will contain beneficial amounts of these vitamins that can help prevent deficiencies. B vitamins also help to treat or prevent common issues with aging, such as fatigue, dry skin, brittle hair, digestive issues, and more. Pregnant Women – The B vitamins are important to healthy pregnancies and fetal development. Thiamin plays an important role in the baby’s brain development, pyridoxine is important to both brain and nervous system development of the fetus. Folic acid (vitamin B9) is needed the most, and can help prevent birth defects. The rest of the B vitamins support the health of the mother. Vitamin B supplements can benefit a pregnant woman’s overall health, as well as support the healthy fetal development of the baby. Those with Migraines – Migraines are recurring attacks that cause moderate to severe pain, usually in one region of the head. About 12 percent of the the United States population suffers from migraines, with the overwhelming majority of them being women. Taking B vitamins may reduce the frequency and severity of migraine headaches, according to a randomized, double-blind placebo controlled study. Those with Sleep Issues – B vitamins are used for the synthesis and release of neurotransmittersthat are involved in the regulation of sleep and the sleep cycle. Powerful vitamin B complex supplements are very effective for for treating restless leg syndrome, insomnia, and mental health (which may contribute to sleeping problems. Vitamin B complex supplements rarely causes side effects, but may cause allergic reactions in some individuals. Allergic reactions may include swelling, tingling, and numbness. Taking high dosages may also cause side effects, however B vitamins are water soluble and excess often is excreted through urination. The best vitamin B complex supplements are most effectively taken before meals. They are also best taken in the morning, especially if you are taking them to support quality sleep. If they are taken at night, they may make it harder to fall asleep quickly. Vitamin B Complex, Vitamin D, Calcium, Vitamin C, Vitamin E, Zinc, Iron, and Iodine for Beauty Support –All of these vitamins and minerals stacked with vitamin B complex are perfect for promoting thicker hair, stronger nails, and beautiful, youthful skin. These are also all of the vitamins that a prenatal supplement should include. This stack acts as a powerful health support, and is one of the best antioxidant stacks. Vitamin B Complex and Protein for Building Muscle – B vitamins contribute to the digestion, absorption, and utilization of proteins in the body. They also support muscle health, strength, and function. Stacking the best vitamin B complex supplements with protein may enhance muscle growth and help to boost athletic gains, making this one of the best vitamin B complex stacks for athletes.